The Flex-Hone® for Chamfer Blending has the ability to blend and radius sharp edges and remove microburrs on chamfered holes eliminating stress risers caused by the chamfering operation. Available in a variety of grit sizes and abrasive types and is suitable for finishing titanium, inconel, super CVM and nickel based stainless steel alloys. This tool eliminates hand finishing operations and produces consistent finishes from hole to hole, part to part. 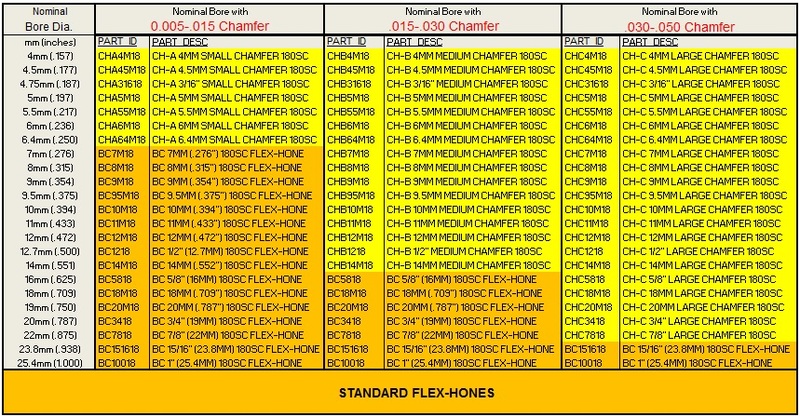 The Flex-Hone for Chamfer Blending is designed for use on any type or size of cylinder from 4mm up to 1" in diameter. Designed to polish and radius the outer corners (the intersection of the chamfer and flange face) as well as the inner corners and hole. 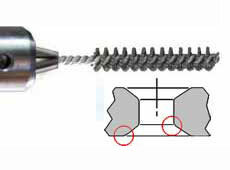 The increased flexibility allows the tool to pass through thin web sections and polish the chamfer on the back side as well. Polished and radiused chamfer surfaces have been shown to be very beneficial on critical rotating parts.